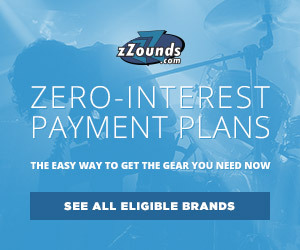 Since its release in 1954, the Fender Stratocaster has proved to be a tried-and-true instrument. 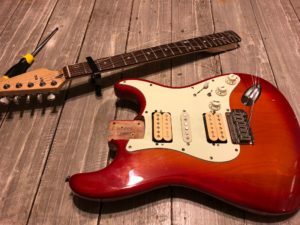 Loved by many for its tone and versatility, it featured a number of innovations that separated it from other guitars of the era, including a three-pickup system which was controllable with a 5-way blade switch. While the new middle pickup gave the instrument five unique pickup combinations, it lacked the key Telecaster combination which gave that instrument its twang, which was the neck and bridge pickup together. 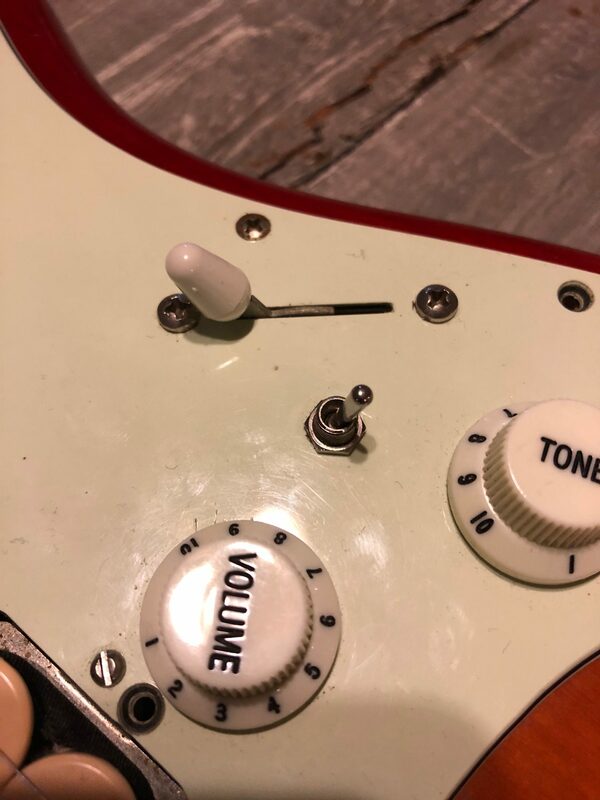 Fortunately, the Stratocaster is also an easily modified instrument, and as it turns out, can be modified to include this sixth pickup combination from the Telecaster. Depending on what parts you have available, and how you prefer to activate this combination, there are a few different ways to perform this modification. Overall you will need a soldering iron – with accompanying soldering skills – some wire, a capo, and a basic set of screwdrivers. Accessing the pots and switches that we need to change can appear to be a daunting task as they are located under the pickguard, which is neatly situated under the strings. Fortunately there is a way to get to these parts without having to completely restring your guitar. Firstly, capo the strings on one of the lower frets to keep your masterful restring job from going willy-nilly, and lower the string tension until the strings become loose enough. 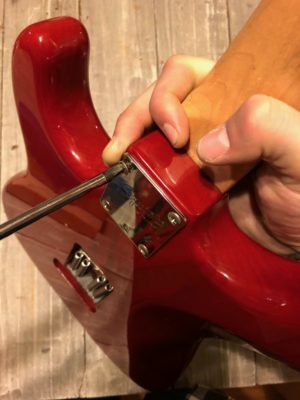 Next you need to loosen the screws which hold the neck to the body of the guitar. After this I like to lay the body of the guitar flat on my work surface with the neck to the side so that the strings are out of the way. 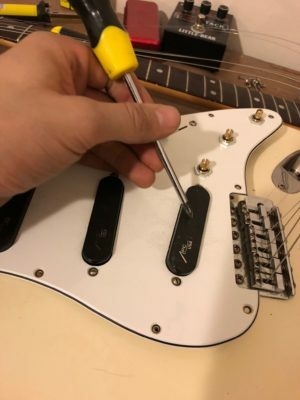 Finally, remove the screws that hold the pickguard to the body, and gently lift and flip it over so that it is laying face down on the body with everything else facing up. 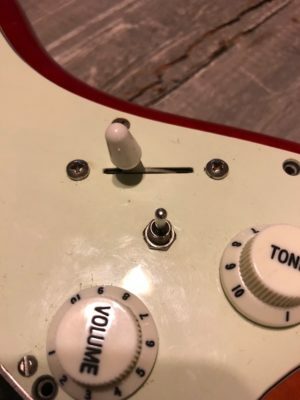 My favorite Telecaster mod for a Stratocaster includes the addition and use of a mini toggle switch. The mini toggle that I had laying around was a double-throw/double-pole, and is a bit excessive for this modification, but is the right size for the job, and may leave some room for a future modification. The simplest part is finding some open real estate on the pickguard to drill a new hole and install the switch. I prefer to keep it near the normal pickup selector switch for simplicity’s sake. 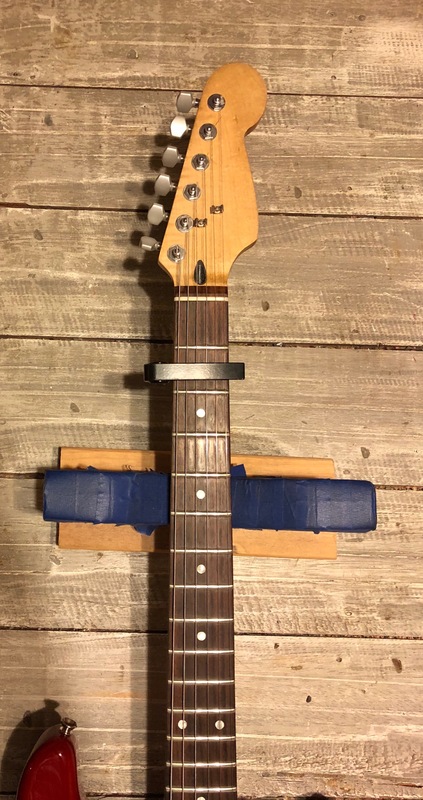 5-way switch set to neck-only position. This switch is basically going to become an on/off switch for the bridge pickup. 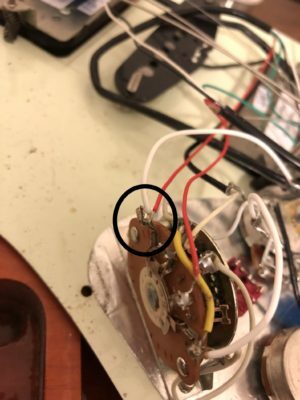 To accomplish this, you first want to locate the lug on the 5-way switch where the bridge pickup is connected. The easiest way to do this is to find the output wire on the pickup itself, and trace it to where it connects to the switch. 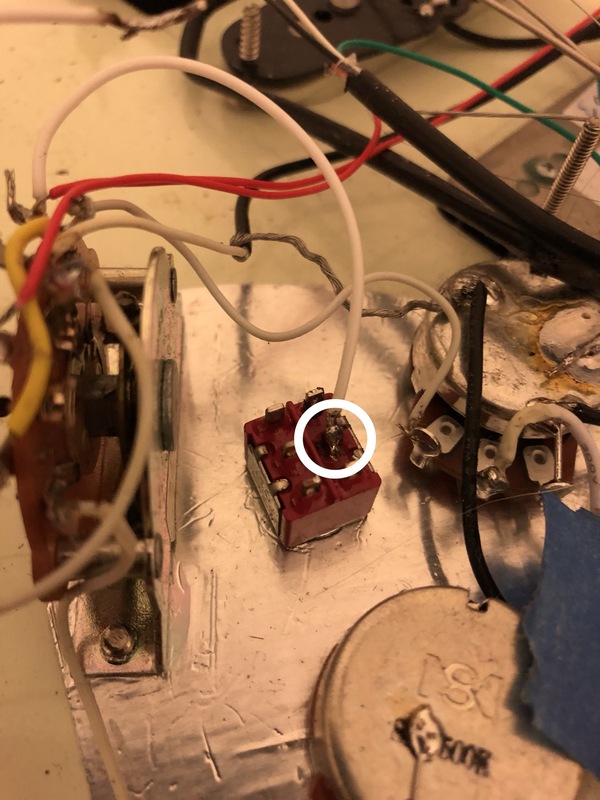 Once you know which is the right lug, you need to solder an additional wire to this lug that connects to one of the center terminals on the mini toggle switch. The second wire you need to add will be from one of the adjacent lugs on the toggle switch to the common lug back on the switch. 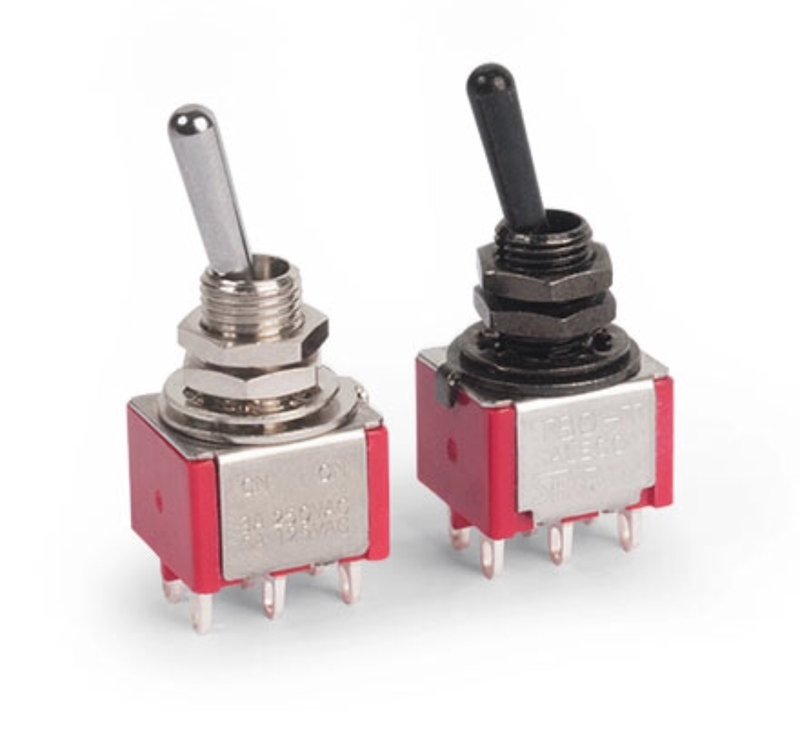 The common lug will most often be the one that connects the switch to the volume pot, which then connects to the output jack. 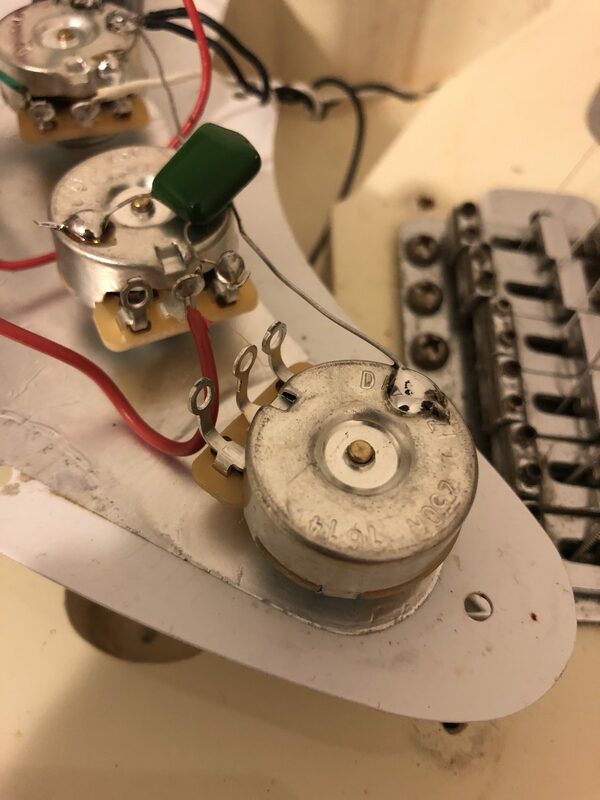 You can experiment with which of the outer lugs you want to use on the toggle switch depending on what direction you want to flip the switch to turn the bridge pickup on. 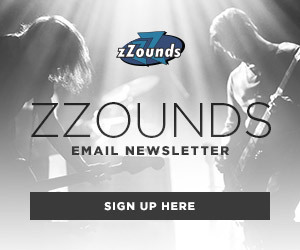 Bridge pickup lug on the 5-way switch. Bridge position lug from the 5-way switch connected to the center lug on the toggle switch. 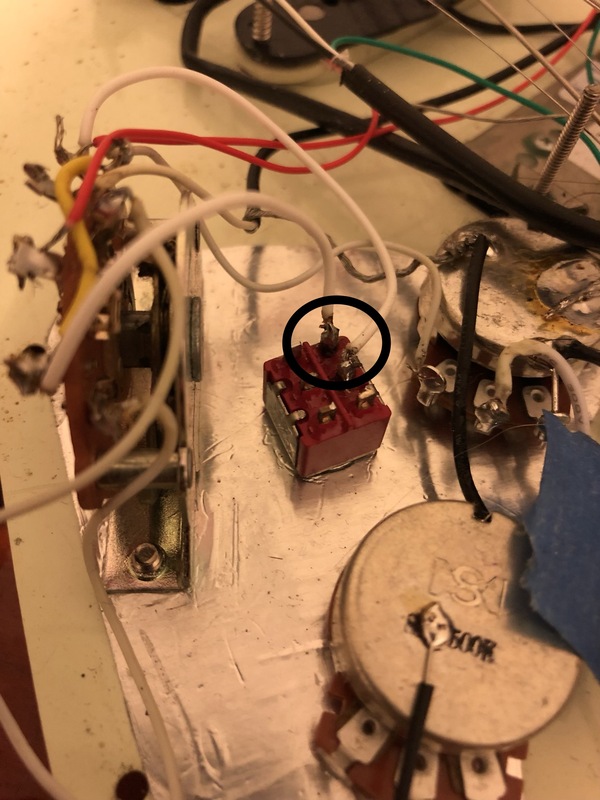 Output wire connected to one outside lug on the toggle switch. Output wire from the toggle switch connected to the common lug on the 5-way switch. And with that, your modded Strat is ready to test. To save yourself the headache of taking everything apart again, it is easiest to test the pickups with a screwdriver instead of waiting for the instrument to be reassembled. To do this, plug your guitar into an amplifier, and tap the pickups lightly which should result in a popping sound from the amplifier. 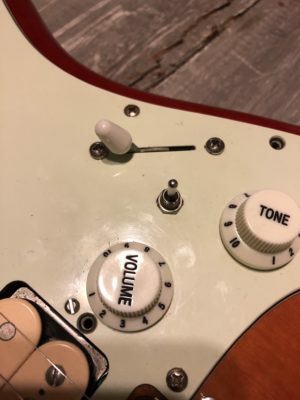 You can test that the volume pot is working, and even check out the tone pots as well. I personally like to start by making sure that the normal five positions on the blade switch work normally. Then flip back to just the bridge position by itself, and flip your toggle to “on”. If done correctly you should hear a pop from tapping the neck pickup as well as the bridge pickup, but the middle pickup should remain silent. 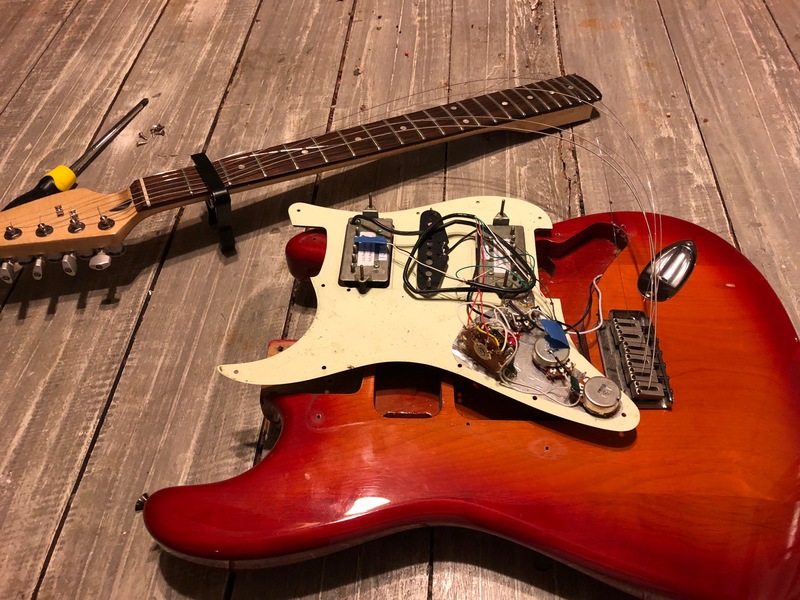 When you are confident that everything is right, feel free to reattach the neck, tune up, and enjoy the sounds of this new pickup combination. Neck-only position on the 5-way switch with the toggle set to turn on the bridge pickup. 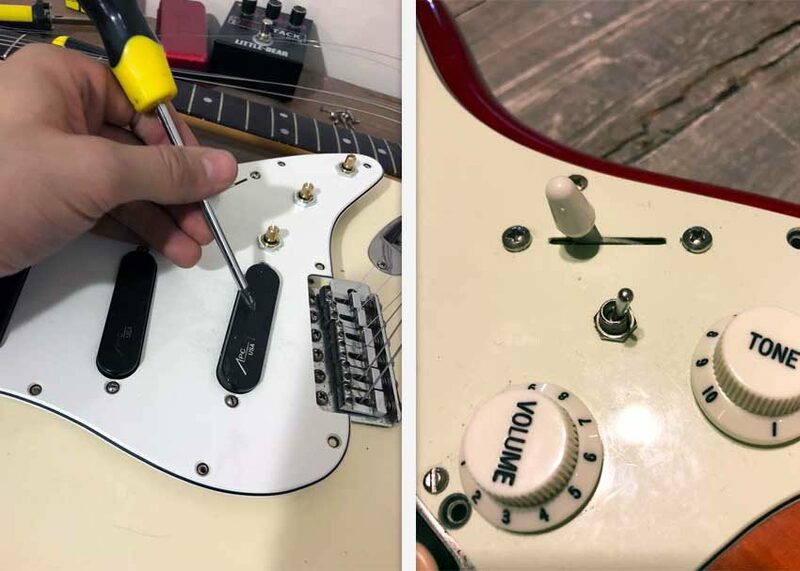 If you are down one toggle switch, you can also perform this modification using parts that are already installed on the guitar. 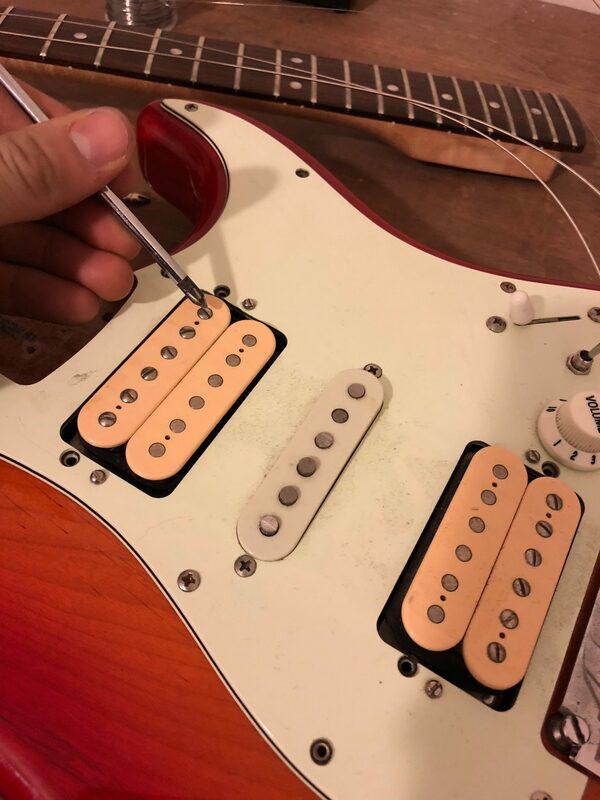 For this method you will need to sacrifice one tone pot, which will instead act as the “on/off” switch for your bridge pickup. It may take some deliberation, but you can choose which one of the two that you want to get rid of. 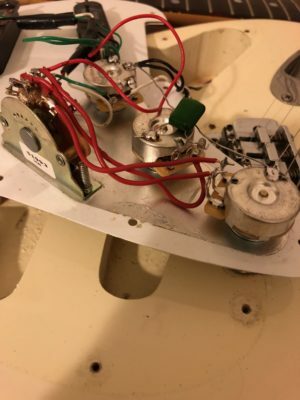 To save yourself some heartache, you can actually re-wire one tone pot so that it changes the tone of all three pickups, and still free the other one for your Telecaster mod. 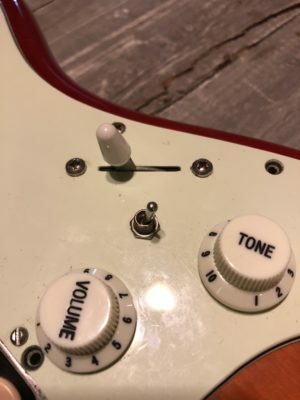 The simplest way is to use the existing tone pots on the guitar. I had recently acquired a set of Dimarzio EP1200 Custom Taper pots that I was excited to test out, so I went ahead and swapped out all three while I had the guitar taken apart. From here, the wiring will prove to be very similar to using the toggle switch. 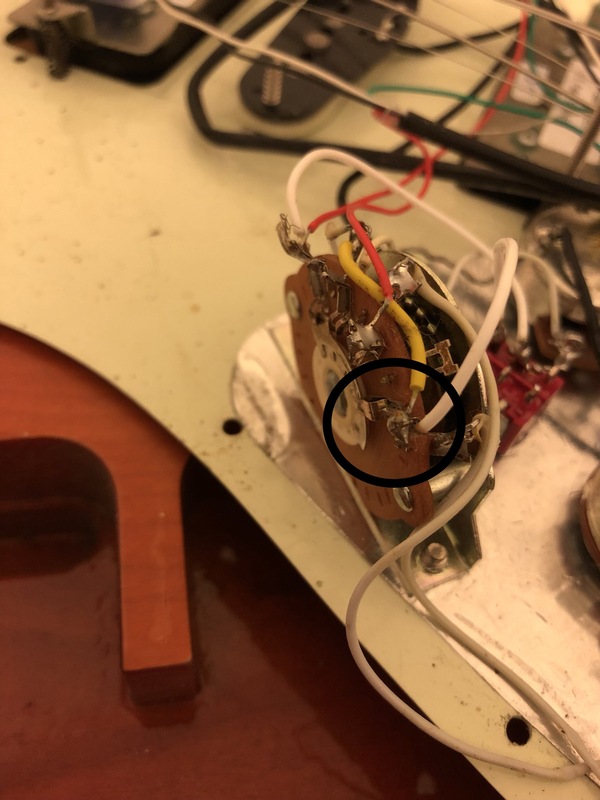 First, connect a wire from the lug on the switch where the bridge pickup connects to the middle lug on the free potentiometer. Then take one of the outside lugs on the pot and connect it back to the common/output lug on the switch. Which outside lug you use will change the direction you need to turn the knob to blend in the bridge pickup, so this may require some experimentation. Tone pot with wiring removed is now ready to be re-wired as a blend pot. Blend pot with wire coming in from the bridge pickup lug on the 5-way switch. Output wire from the blend pot going to the common lug on the 5-way switch. When you have your wiring set, you can test your work using the same method as before. 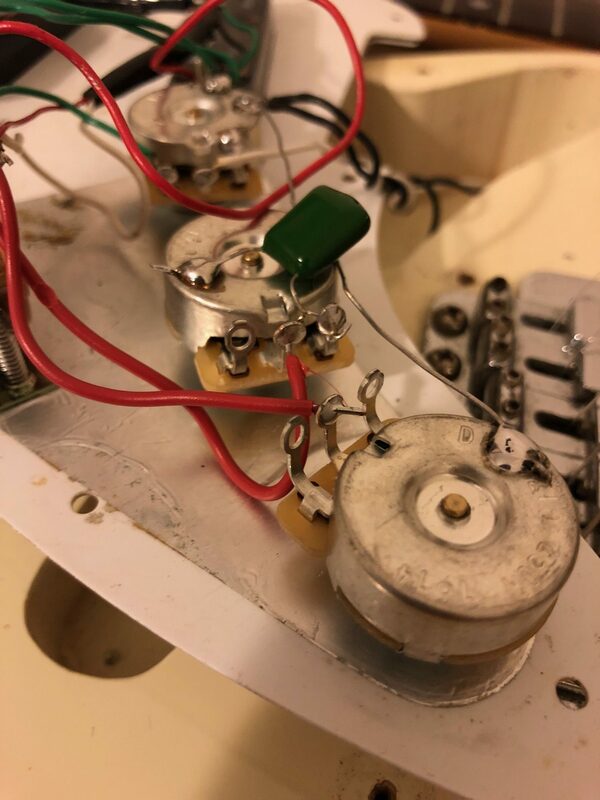 Set your switch to where it is in the neck-only position, then slowly turn the pot you wired from zero to ten while gently tapping the bridge pickup. If everything has been wired correctly you should hear the bridge pickup slowly increase in volume. The benefit of using this method is that you can actually blend in the tone of your bridge pickup, as opposed to simply turning it on and off. If you haven’t figured out already, there is a hidden seventh pickup combination available once you have completed this modification, which is to use all three pickups at the same time. Simply set your 5-way switch to the neck and middle position and turn on your bridge pickup and you will hear the sound of all three pickups working at once. 5-way switch set to neck and middle position. Neck and middle position set on the 5-way switch with the bridge pickup toggled on. All three pickups are now active. These are just two ways of achieving this modification, but if you look, you will find that there are even more ways of making this wiring work. Once you are familiar with how the wiring works, this modification can be completed in about a half hour. That’s only thirty minutes, and less than $10 in parts, and you have the trademark sounds of a Telecaster coming from your favorite Strat!